Shell has closed one of their local gas stations but I still love that big canopy. I used Topaz Impressions to process this photo. 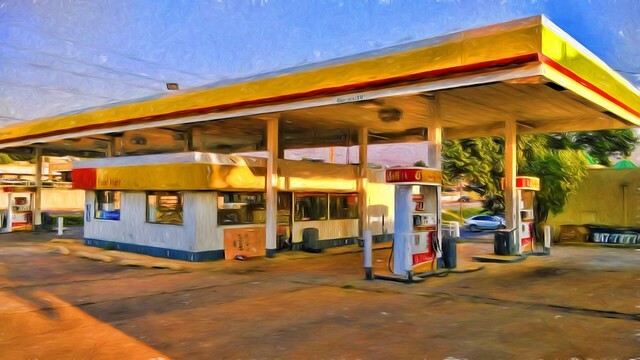 This entry was posted in Digital Art Meme and tagged "Topaz Impressions", Abandonment, Digital Arts, Gas Station, Tulsa on August 18, 2015 by Alan Bates. It’s always sad to see LOCAL businesses closing the doors…but I can’t feel sorry for big corporations when you know they’re overpricing for the consumer…like any oil company. LOVE the textures here…like a painting. UH-OH! I wonder why Shell has closed this station! The colors really do stand out with that filter. Any time a business closes it’s always bad for the local economy – lost jobs and fewer goods/services choices for the consumer. 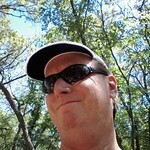 … just a shell of its former self. Your ‘painting’ here works! I like the way the edit brought out the colors. The contrast between the blue sky and the canopy is exceptional, Yogi!